I see people (including myself) cooking boneless skinless chicken breasts all the time….they are so simple to do, and have a ton of great uses. However, there’s always something special about cooking meat on the bone, and here, I’m going to show you how to roast off the perfect bone-in chicken breast. When you roast on the bone, the meat tends to be more moist and flavorful, which is why I roast whole chickens all the time. But for the white meat lovers out there and those that don’t have the time for the whole bird, it’s still really simple and fast to roast chicken breasts. Take a look at the video and follow the steps below, and they will come out perfect every time. First off, make sure you buy a good quality product. Bone in, the meat will tend to say more moist, and I think it has more flavor than boneless chicken breasts. If you’d like, find an organic, or free range bird, but frankly, I think even the standard plain old breasts are great. Second, take the opportunity to add some flavor. You can use just about anything you’d like with chicken. Get a store bought rub or you can come up with some mixes of your own making. In this demo I’m using a mixture of herbs (and olive oil), which I rub on the chicken and allow them to sit for a few hours. Third, after marinating for a couple hours, take the chicken out of the fridge and allow the breasts to come up to room temperature, before putting them in the oven. Room temperature meat will cook more evenly, and won’t lower the temperature of the oven when you put in it. Fourth, right before you put the chicken in the pan is the time to season with salt and pepper. The biggest problem I see people make is under seasoning, so use a good, liberal amount of salt and pepper on every side, nook and cranny. Fifth, get a pan going on the stove top over medium high heat, and let it come to a good high temperature before adding the chicken to it. The hot pan will ensure a good, golden brown sear on the outside that adds some great texture to the chicken, as well as awesome flavor. Six, Once you have a good hot pan, start cooking the chicken with the skin side down. It’s a general rule in cooking to start cooking the “presentation” side. With a chicken breast, that’s the skin side, and starting there will ensure that the fat will render out which will make it crispy and delicious. Seventh, cook on the first side for about 5-6 minutes until the skin is browned. Make sure to allow the chicken to stay in contact with the pan, rather than checking every minute or so, which cools things off and slows down the process. You should only check it once around the 4 – 5 minute mark. Then flip the chicken over in the pan and then immediately move it into a 350 – 375 degree oven for about 10 minutes to finish cooking. You’ll want the internal temperature to be 155 – 160 when you take it out. Eight, let the chicken rest. When it’s right out of the oven, the natural juices are moving all over, cut into the chicken, and those juices run right out of the bird. Resting allows the juices to settle and stay in the meat…giving you a better end product. 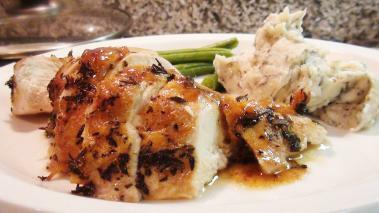 Finally, as an optional step, when you cook chicken breasts like this, you can easily make a great pan sauce. While the chicken rests, put the pan with the drippings back over high heat, and add a bit of wine. Once reduced, add some chicken stock, some herbs and reduce again. Turn the heat off, add a pat of butter, and stir it in, and you’ve got a great simple sauce to pour over the chicken. Once the chicken’s rested, you can either serve as is, or use a carving knife to take the breast meat off the bone and serve it carved. You’ll find the meat is super tender, moist and flavorful.